Piggybacking off the success of Lil Wayne, Drake and Nicki Minaj, We Are Young Money is the first group project from Weezy’s Young Money crew which introduces their lyrical abilities, and also give them the opportunity to have success on a platform that they may not have had as solo artists. Lil Wayne’s Young Money team is comprised of Nicki Minaj, Drake, Jae Millz, Lil Twist, Tyga, Mack Maine, Gudda Gudda, Shanell, T-Streets and Lil Chuckee. 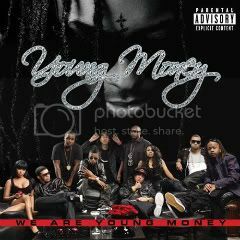 Young Money affiliates Lloyd, as well as Birdman and Gucci Mane are also featured on the compilation. With a roster that’s the size of a street gang, the debut album from Young Money sounds more like a mixtape than an album. I must admit however, there are several lackluster performances of some of the artists, which can be attributed to the rappers inexperience as artists. Lil Wayne definitely gets his shine, as he accompanies almost every track with the exception of Girl I Got You. With so many members in the group, many were unable to stand out: Gudda Gudda, Mack Maine, T-Streets, Lil Chuckee, Lil Twist are not distinctive. Out of the entire group, Jae Millz proved to be the best. Although Nicki Minaj and Drake are the Young Money “MVP’s” they do not outshine the other artists on the album. Roger That is a teaser for Nicki Minaj’s upcoming album and she’s definitely able to take the crown for best female MC. The existing commercial singles Every Girl and Bedrock are also featured on the album and some of the only tracks that really feature most of the artists. On the 15 tracks we hear production from David Banner on Streets Is Watchin, Tha Bizness on Mrs. Parker, (a track better suited for one of Wayne’s mixtapes), as well as the production of Kane Beatz and Chase N. Cashe. Not a bad start for the Young Money crew. Reminiscent of the Rocafella, Ruff Ryders, G-Unit and Murder Inc. days, Young Money is the next dynasty to hold the thrown. Let’s see where they take it. It’s Young Mula baby.